It burns, it burns! I have some kind of impending flu, the primary symptom of which is a pain I can only believe comes from rotting bone marrow. The cough and headache are amusing distractions by comparison. So blogging will slow. Fortunately, good stuff at Beer Around Town (Fallen Friar Review), It's Pub Night (Vertigo Brewing review), Hops and Barley (beer tax! ), Brewpublic (nice piece on East Burn), Brew Site (beer reviews), and something about an IPA taste-off I don't really understand. I'll be off to die now. The present tax translates into less than a penny per 12-ounce beer. It's about the lowest in the country, unchanged for 32 years. The higher tax would tack a 15-cent tax on 12 ounces, a 20-cent tax on a pint. That comes from an article in Thursday's Oregonian--though the calculation of the tax in terms of cost to the customer on a per-glass basis is ubiquitous. It's pure spin, and it's absolutely neither fact nor a part of the policy. The bill proposes an excise tax on beer at the production side, not a retail tax. No one has any idea how much the excise tax will affect beer prices. Backers use this framing device to minimize the perceived effect of the tax. This is political spin, not fact. Rather, it seeks to obscure fact. Some people use a different word for language that obscures fact. Pinning the tax to a phony per-glass cost has the additional advantage of hiding who actually pays the tax. Consumers are asked to think they're picking up a very modest cost to pay for a large public benefit. Great politics, pure BS. If any reporters happen to stumble onto this post, recognize that by identifying the costs using the spin of the beer-tax proponents, you are participating in the politics of the debate. That's not reporters' job, and my guess is the ones doing it aren't aware of the mistake. 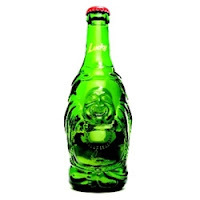 I won't embed this--I don't want it on my site--but I think this ad resolves the question about the orientation of the makers of Lucky Buddha beer. (Background here.) Uggh. A few weeks ago, when I visited the Rac Lodge, I asked Ron if he used any brettanomyces in his beer. The look he gave me was akin to the expression a tower guardsman might wear while observing a horde of Huns swarming over the moat. Emphatically no. I don't blame him. When you're messing around with wild yeasts, the decision about whether to invite Brett over is one not to take lightly. Brett is the Kali of yeasts, the destroyer of cities, eater of young. To add it to your beer is to submit to forces beyond your control, to cede dominion to a single-celled organism. I was reminded of this decision as Sally and I watched the Oscars on Sunday. (Not a bad show, and I was psyched to see Sean Penn win for best actor in what I thought was the year's best film. Gus should have taken the statue for directing, and Slumdog was vastly over-rated. Still, seeing the glee of the half-Indian crew made up for the misplaced lauding.) We pulled out an '08 Cascade Kriek and a Dissident. In the former, no brettanomyces; in the latter, ample stores of the lush, horse-blankety bad boy. There's a remarkable difference in the way the two have aged. The Kriek is much as I remember it from a year ago. The cherry character has faded a bit and become less distinct, but that's to be expected. The intensity of sour remains about where it was, as does the level of sweetness. In short, the yeast have pooped out, and any changes to the beer now are unrelated to their activity. [T]there's none of that skanky brett, but rather a sweet chocolate and sour cherry-accented nose. As it opened up, the astringency of the sour diminished a little and the cherries muscled their way in. It is a lovely and approachable beer.... The body is creamy and rich, with malt notes contributing a brown sugar/biscuit base. Onto this are balanced the twin flavors of tart/sweet cherries and the sourness of the yeast and cultures. It's a totally different beer now. The brett have muscled their way in; the beer has their characteristic horsey aroma, and the palate their musty sourness. And they've continued to break the beer down--it is now bone dry. The malt notes are gone, and the body, while still rich, is less creamy and more vinous. Anyone who fell in love with this beer in the fall might now find it too intense and lacking in that velvety luxury they admired. But for those who revel in the character of brett, this is something else. The progression is very similar to Orval's--the young and older versions of the beer don't even appear to be related, much less the same being. At the time of release, Deschutes listed Dissident as 8.8% alcohol. Based on the way Orval gets stronger, I'd bet it's well into double digits now. To brett or not to brett, that is the question. Most of you will miss this, so I'll briefly bring it to your attention. I posted a comment about beer pricing by Chris from Belmont Station a couple weeks ago, and one of the main subplots involved Rogue. Today Brett Joyce replied to the comment. You can read it here. It's an interesting debate and I take no sides. I'm just an ignorant blogger. "It’s an Asian influenced lager style, but it was born in Australia (the ‘Lucky Country’). It is at home in city bars, but lives all over the world. It also offers a truly unique proposition to everyone who comes into contact with it – share the good fortune. "Rubbing Buddha’s tummy brings Good Luck!" Buddha images are regularly appropriated for all kinds of things. For the most part, the appropriations are well-intentioned, as I took Laughing Buddha's to be. This, however, is a modern incarnation of Sambo's. It's a crass attempt to cash in on the ignorant misappropriation of a cultural/religious symbol. In substantial sections of the world, it will be held as offensive. The brewery couldn't care less about the Buddha except as a vaguely-transgressive marketing tool that tested well with young urban professionals who frequent night clubs. Pinheads. 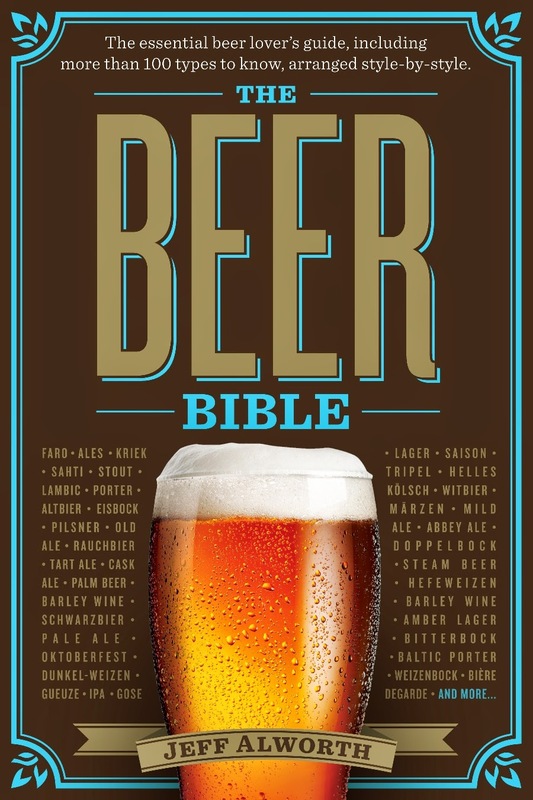 I am sidling up, very coyly, to the idea of putting together a beer book proposal. I don't want to make any sudden moves lest I spook the idea and scare it away. At the moment, I'm trying to put together the conceptual framework, and one element involves thinking about the "pyschographic" map of the US's central brewing regions. Breweries are scattered across the country and every state has at least one craft brewery. But the differences in regions are pretty remarkable. The Mountain West, West Coast, and New England all have about one brewery per 110,000 people, plus or minus a few thousand. Parts of the Midwest are 1 in 125k. The South, by contrast has one craft brewery for every half-million. All of that's pretty straightforward. It's the Mid-Atlantic, however, that's thwarting me. My suspicion is that look at state stats aren't much use. 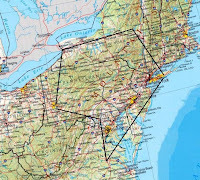 There's a rich vein of breweries between Baltimore (maybe DC) to NY--a span of a couple hundred miles. If you ignore state boundaries, this region is heavily-breweried. Moreover, I think it's a distinct brewing region. It was one of the only parts of the US where regional breweries hung on through consolidation, and it has more than a few of the most notable craft breweries. They seem to produce an older style of beers consistent with those old regional breweries--lagers and lighter ales. Yet per-capita stats don't help much because there are so many people. You get something like 1 in 275k, depending on which states you include-abysmalby comparison. What I'm looking for is a coherent area in which the history, brewing styles, beer culture, and consumption patters knit the region together. In the Northwest, for example, we have a long history of local brewing, and this fed interest in the early micro explosion. We like intense flavors, and so prefer bigger, hoppier beers. Our parochialism sustains a rich culture of events and support for local breweries, including very small ones. And perhaps most notably, we consume beer disproportionately in pubs when compared with other regions--a feature of the weather, perhaps. Is there a coherent, Mid-Atlantic region? If so, do you think Lew is about right on its boundaries? 1. If the photographer tells you to tip your hat back so there are no shadows on your face, don't do it. Either demand the shadows or take off the hat. As you can see, tippng the hat back makes you look like a twit. 2. If the photographer tells you to smile, smile. If you refuse to, a game will ensue in which he attempts to get you to smile, telling you really, really bad jokes about Celine Dion. You end up with a swallowed half-smile and look like a twit. Even a fake smile would have been better than this. 3. If the magazine is paying, you might as well pound the beers. It will aid you in #2. 4. If the magazine gives you the option not to do the photo shoot and you look like me, graciously accept the offer. For the record, we shot this picture in the Horse Brass. Also, Sunset--I should confirm that I'm talking about Sunset Magazine here--did buy the beer, and we tried a Bluebird Bitter, Trumer Pils, and a stout of garbled provenance. The waitress mumbled the name of the stout she brought--'swmlmmsbbt stout,' it sounded like--but it was thick and meaty and tasty. It appears in front of me and is clearly the only un-silly thing in the photograph. The hat in question bears the Blazers swirly logo. I would have looked cool with it on my head naturally and my face shrouded by the forgiving gauze of darkness. 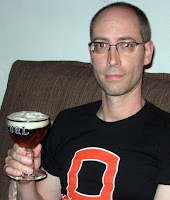 Following my post earlier this week on nationwide beer taxes, the Oregon Brewers Guild's Brian Butenschoen sent me a few more interesting factoids. I decided to wait a bit before posting them, because I figure I get no more than two or three beer tax posts a week before I drive you all away. Okay, ready? Per capita consumption of spirits is up 33% over the last 10 years; over the same period, beer consumption ticked up just 2.8%--and beer consumption has fallen over the last five. Of the top 10 craft breweries in the U.S. in 2007, all got their start in states with low excise taxes. The average tax rate when they started was $2.33. Between 2004 and 2008, the impact of local breweries on the economy grew substantially. The percentage of Oregon-made beer consumed in Oregon grew from 9.9% to 12% and the number of jobs grew from 2,950 to 5,200. From 2004-2008 for every 1,000 barrels Oregon brewed beer that was consumed in Oregon more than 30 jobs were created. In the body of the email, Brian rather tartly posed a question I hope he asks of the legislature on Monday: if we have a problem with alchohol, why are we considering raising the tax on the only segment in which consumption is declining? 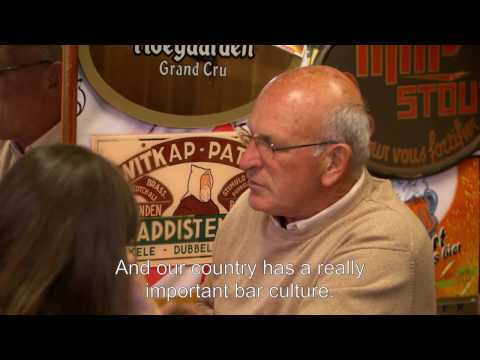 Particularly given that within that segment, local beer is steadily supplanting national brands as the the choice for consumers, creating jobs and boosting the economy? Here's a thought experiment. Not an experiment so much as mental time travel. Or something. Anyway, imagine the year is 1981. You sport a wicked fu manchu and despise this "new wave" music and all that Kim Carnes stands for. But not all change is bad. Some hippies from out in California have introduced a bunch of beer that is strong and strange and you can't get enough of it. You've tried their Pale, Porter, Stout, and Wheat, and you can't wait for the next thing they release. In the meantime, maybe you'll go check out this new Betamax thing so you can record Bob Marley on this new MTV thing. When they're not showing that "Bette Davis Eyes" crap. You can imagine, then, that Torpedo was greeted with a little anticipation. To add to it--if that's possible--Torpedo is an IPA, perhaps the most-popular and most overexposed craft style in the country. So how do you achieve originality when, in the intervening three decades since you last went out on the line with a regular beer, 1500 American breweries have made just about every style on the planet? It's quite a condundrum: brew something distinctive, worthy of your status as the country's most-popular brewery, but also something your broad fan base will recognize and appreciate. Familiar, but not too much so. I think I mentioned earlier, that there are only about 3 acres of this hop anywhere in the world. There just isn't that much of it to go around. I was in our hop freezer this afternoon, and we have a solid 250 lb bale. I think that's it. Total. End of story. The variety Citra, with a alpha acid content between 10-12% and an oil content of 2-3 % originated from a cross between the female European noble aroma variety Hallertauer Mittelfrueh and a male that was derived from the variety known as U.S. Tettnanger. Citra is 50% Hallertauer mittelfrueh, 25% U.S. Tettnanger and the remaining 25% is East Kent Golding, Bavarian, Brewers Gold and other unknown hops. Citra has a special flavor and aroma that it imparts to beer. Depending on the brewing process and the hopping rate, the flavors and aromas of beers hopped with Citra might range from grapefruit to lime, melon, gooseberry, and lychee fruit. Traditional dry hopping is really wasteful, in regards to the amount of hops used. With traditional dry-hopping, hops are literally stuffed into bags and placed inside of the fermentors. The hops at the center of the bags don't get as much contact time with the wort and there's really no way to measure how much of the aroma is imparted on the beer from batch to batch. With the torpedo device, there is a known quantity of hops used in the thing, and it can be used with a big volume of beer. Requiring less hops by volume, with a BIG difference in imparted flavors. So there you go. In other regards, the beer is a pretty standard IPA: 17.8 P and 7.2% alcohol, 70 IBUs, Carapils and crystal malt. The brewery's really hanging their hat on the Citras. Much as you'd expect, it looks like a straightforward IPA--a bright amber and a frothy oatmeal head. The aroma is piney and resinous; these are the familiar notes. On the label, SN describes the other, unfamiliar ones as "herbal." Perhaps this is a euphemism. I get a more classic catty quality (funny how "catty" has fallen out of favor as an adjective, isn't it?) --thinking of the fu manchu, though, maybe this is "herbal" in the cannibis sense. Stanky, sticky. It tastes more or less like this, too. The two dominant qualities are pine and catty resin, but there's citrus, too, and maybe a touch of peach. It's a bold, characterful beer, and I like that it's getting mixed reviews. Beers that take chances don't please everyone. But those who are pleased will love the beer--and for them, there won't be any competition. [T]here has generally not been much of a relationship between alcohol purchases and changes in GDP -- the correlation is essentially zero. Nor have alcohol purchases historically been any kind of lagging or leading indicator. These are Commerce Department data, and we don't have details about which segments aren't selling well (if you follow the link, the relevant line is 85). Nor is it broken down by region or state, so we don't know if it's a geographic finding, either. What we do know is that things really took off in the second quarter of 2007, hit a high a year later, plateaued for two quarters, and then in Q4, fell off the face of the earth. Aggregate sales have fallen back to a level they were at before the spike in '07. Much more to learn, but this isn't a good sign. It's often useful to see a whole before you try to understand a part. Thanks to data supplied by the Tax Foundation (prost to Jacob Grier), we have a decade of beer taxes. I have dumped these into an Excel spreadsheet, ignored the footnotes (tax data are incredibly byzantine--there are all manner of exceptions and add-ons and funkiness), and have a rough idea of what kind of taxes states actually assess. Given that there's a lot of talk about Oregon's obscenely low taxes, it's worth seeing them in context. Below the fold I'll include a list of all 50 states and DC. But first, here are some interesting facts. In this case, the median is more useful. (The median is the point that divides the group in half. If ten guys are sitting in a bar and they all make $50,000 a year and Bill Gates walks into the room, the mean income skyrockets. The median, more useful in describing the income distribution of the bar, barely budges.) Twenty-one states have beer taxes of five bucks or less per barrel. Only 13 have taxes over $10 a barrel. Only five are above $20, and three above $30 (though one member of that club, Georgia, jumped more than sixteen bucks to $31 in January). (For you data geeks, I didn't average the per-capita numbers, but actually went to the state populations, since they obviously vary a lot.) Upshot: taxes don't appear to influence consumption. Hard to say whether that's a pro or con on the beer tax: discusss. Okay, here are the state-by-state taxes. For fun, I'll include per-capita consumption as well--though the most recent data are just from '07. What an odd winter. Western Oregon has felt more like Bend this year than the Willamette Valley, with long periods of dry, sunny cold punctuated by flurries of snow. Today, as I sit looking out over a slate sky through the black fracture of a dormant maple tree, it feels a bit more like home. Some wet back in the air. After what feels like a rather longish period of stasis--breweries buried under December snow and hibernating?--these earliest signs of life welcome the blossoming of Spring beers. My nose tickles with itch of pollen. Outside, on the lawn, bulbs push up through the mossy yard. (Why do Portlanders plant bulbs in their lawns?) I have tried three of the spring beers in the past two days, and here are brief reviews. For reports of pollen and flower activity, you'll have to look elsewhere. Each year the Widmer Brothers offer a beer under the "W" label. That is about where the similarities among them end. The last three years have featured a big NW red, a Summit-hopped pale, and a wheat beer. Add to that this year's edition, a Belgian, and you have quite a bit of diversity. It looks like the series is actually a kind of depth charge: the brothers toss out a strange beer and see what happens. The big red came back as Brrr and the pale as Drifter, slated to be released later this year. And this year's Belgian is already in edition #2. Some of you will remember it from its debut almost a year ago at the Cheers to Belgian Beers event. Last year, every brewery made a beer with the La Chouffe (Ardennes) yeast, and mostly, they made beers like La Chouffe, as did the Widmers. Let us begin by stipulating that La Chouffe is a hard yeast to work with. Having now sampled beer created by it perhaps 30 times, I'm prepared to add that it's not a particularly tasty yeast. Beers come out sweet and heavy, two qualities brewers generally try to avoid. I personally think the Widmers did a better job than most of the other breweries I tried, but having surveyed some of the blogochatter, not everyone agrees. The beer is honey-colored, slightly hazy, and sports a white, seltzer-like head. Shadow coriander is a prominent note in the beer, though Rob swears there's nary a spice in it. I get the note in the nose along with an herbal, clovey one and also a bit of bubblegum/banana. It's quite a nose. The flavor follows the scent--sweet, with that bubblegum candy quality. I'd call it phenolic, but I also thought there was coriander. It's smooth, easy to drink. Go buy a sixer (or just a bottle) and tell me what you think. Deschutes has made two beers for the sesquicentennial, one at the Bend brewery and one in Portland. This is Cam O’Connor's Portland offering. Made with all-Oregon ingredients (Klamath barley, Willamette Crystal hops, yeast from Wyeast, and sugar from Nyssa sugar beets), it's a Belgian strong, sort of a dry tripel. The nose is pronounced in a Belgiany-musty fashion ("Belgiany-musty"; see, that kind of descriptive muscularity is why I get paid the big bucks). It's a bit aggressive on the palate for my taste--alcohol comes roaring and biting its way onto your tongue, followed by a bitter herbal/licorice note. The sugar fermentation is evident by that biting alcohol, but also creates a sophisticated, dry finish. Once my Caeser salad arrived, I liked it a great deal more. It really went nicely with the garlic and lettuce. My instant reaction was condemnation and rejection. However, I was waiting for a showing at the Portland Film Fest, entertaining myself with the UConn-Pitt game, and I kept working on the beer. Damned if I didn't start to enjoy it. By the end, I was actively wishing I had ordered a pint instead of a glass. An odd, odd beer. But one I wouldn't shun. Nope, wouldn't shun it at all. Last night, tuning into KGW to get the wrap-up on the All Star game (Brandon acquitted himself nicely), I saw a piece on two new Deschutes beers, brewed for the sesquicentennial. I posed a question earlier this year about what kind of beer would be appropriate for the milestone; well, here's what a couple brewers from Deschutes came up with. Maiden Oregon Ale, brewed at our Portland Brew Pub by Cam O’Connor, is a Belgian amber ale that was brewed using Crystal hops from the Willamette valley, organic 2-row barley from Klamath Falls, water from Mt. Hood, Oregon beet sugar from Nyssa, and yeast from Wyeast labs in Hood River. At 8.0% alcohol by volume, this one will be best enjoyed sipped out of a snifter glass. Oregon 150 Ale was brewed at our Bend Brew Pub by Paul Arney. This beer has a very unique color and flavor that makes it hard to categorize. Brewed with barley malt grown in the Klamath Falls basin (malted in Portland), blackberry honey from Yamhill County, Oregon marionberries and Crystal hops from the Willamette Valley we have created a beer like you’ve never tasted before. Our mash conversion took place at, you guessed it, 150 degrees! My grandparents lived in Nyssa, and my aunt and uncle farm nearby in Vale (though they no longer grow sugar beets). It was a hallmark of my youth to see the White Satin plant as I drove across the border from Idaho to visit them. So it will be a delight to see if I can taste the Nyssa influence. We have been experimenting with different hops and hop addition techniques. Some new, some old and some quite unique. Through all of this, our quest has been to produce a teeth staining, mouth numbing, tongue scraping IPA that would impress the most iron-lipped hop head. We have come a long way and, judging by the reviews I’ve read on BeerAdvocate.com many of you also think we’re doing pretty well with that. I welcome this move by breweries to start blogging (you'll notice links in my blogroll to brewing bloggers). It's really fascinating to see the thought processes behind the beers. Keep it up, men! On this day in 1859, President James Buchanan signed the bill that gave territorial Oregon statehood. In terms of antiquity, 150 years doesn't much rate--even by US standards. We're recent-vintage history--there are probably people alive today who knew elderly kin who were alive during territorial days. That puts us within the range of living history. People in places like Jerusalem, Cairo, Varanasi, and Beijing would smile wryly at our little accomplishment. In terms of changes, though--Oregon's seen a lot. When we became a state, slavery was still legal. The British Empire stretched across the globe. Steam power was state of the art (and fire lit and warmed our homes). Football hadn't been invented, and baseball was just two years old. Names like Siam, Persia, and the Austrian Empire. In other words, things have changed a fair amount for the average Oregonian. In one respect, however, things haven't changed: we still enjoy a good beer. When Buchanan penned us into officialdom, Oregon already had three breweries: the Eagle Brewery in Jacksonville, a short-lived place in Oregon City run by the brewer Louis Behren, and of course Henry Saxer's Liberty Brewery in Portland--the one Henry Weinhard would buy a century later. In fact, for the entire history of the state--except when it wasn't legal to brew beer anywhere--beer has been brewed here locally. The thread grew thin indeed after the 1940s, when it was only Henry's brewery that kept the tradition alive, but it never broke completely. In 1859, when Oregon celebrated its statehood, we might imagine shaggy-bearded roughnecks gathered around fireplaces in pubs lit dimly by oil lamps. They had no Blazers to discuss, no stereos to play music, no cars to carry themselves to parties. But they did have beer, fresh and chilled by the February cold, and no doubt they raised bottles in salute to this new piece of America. We can do the same today.